Simple, Elegant, Private & Perfect! 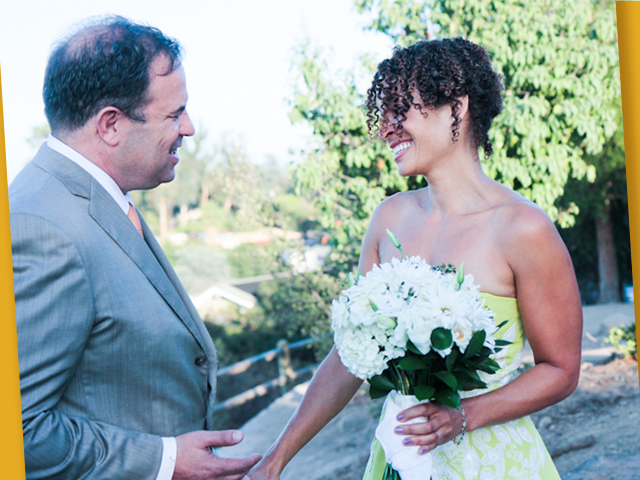 Filmmaker/Screenwriter/Author, Rod Lurie married New York Times Bestselling Author, Kyra Davis. Simple, elegant, private and fun were the watchwords as Jordi & CO helped develop the plan for their ideal wedding. The groom sported a tailored summer suit and the bride was the essence of beauty in a gorgeous garden-party cocktail dress by Oscar de La Renta in summer-yellow with appliquéd white daisies. Kyra held a non-traditional bouquet of daisies, roses, and hydrangea with sprigs of thyme; fresh daisies adorned her hair. The location of the outdoor ceremony (with a view of course!) was hush-hush and divulged only at the last minute to the few family members attending. Back at the house, preparations were being made for an intimate kick-back party for family and just a few friends. Kyra's dress and the couples love of books provided elegant inspiration for the occasion. We created stunning yet simple florals that were presented in stacked beautiful leather faux "books" and travel suitcases. 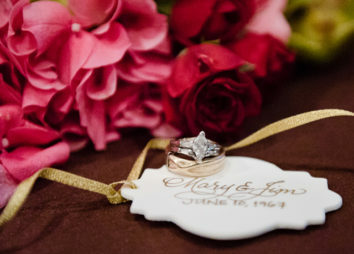 There was an abundance of yellow sunflowers, Equadorian roses in hot pinks and oranges, and dark sensual pink lilies. Sleek chocolate browns and antique golds set the mood. Gleaming glass hurricanes filled with coffee beans were cradled with simple ivory candles. Specialty lighting enhanced outdoor spaces. Large industrial bulbs installed above the outdoor balconies evoked the feeling of the votives twinkling below. By special request from the bride and groom, Jordi & CO also provided catering for the occasion. A "Summer-Thyme Martini" was the custom cocktail for the night (blended with fresh organic lime and Meyer lemon juices). 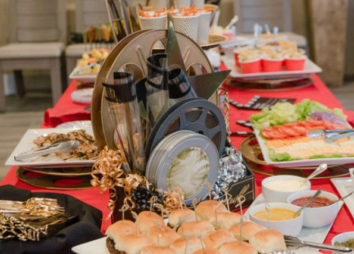 A large buffet set center-room was laden not just with florals, but with a thoughtfully planned assemblage of hearty appetizers meant to satisfy everyone from bacon lover to vegan. Specialty items included mini-deconstructed BLT's (served in a cherry tomato), teeny tiny twice baked (purple and white!) potatoes, sweet pea vichyssoise and gazpacho "shooters," grilled plum skewers with balsamic and chèvre, roasted roma tomato crostini and more. Understated simplicity remained thematic even in dessert. The bride herself sourced the beautifully decorated cupcakes, adorned with delicate butterflies and edible daisies in flavors of lemon with cream cheese frosting and chocolate with salted caramel buttercream.